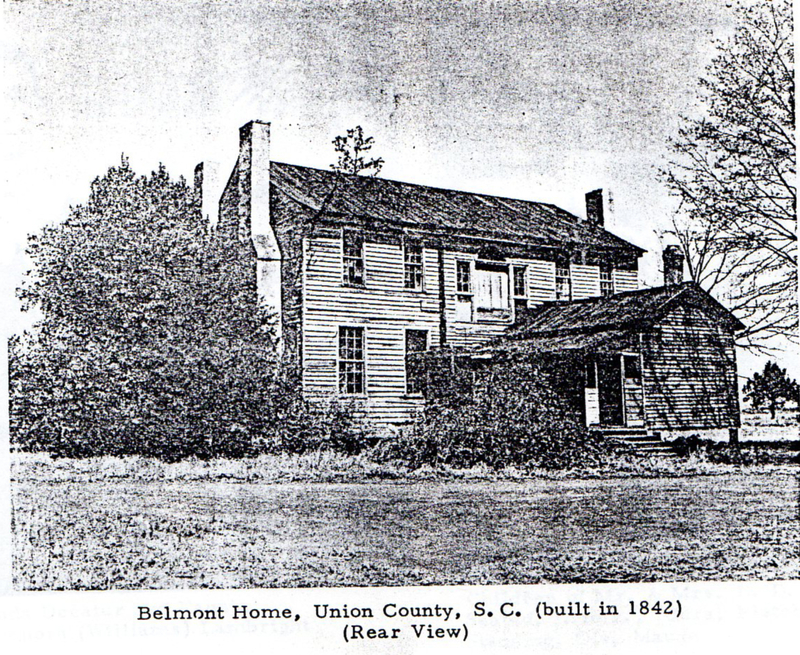 NOTE: Belmont was not a working plantation but considered to be a country estate where the Grimké family lived while Judge Grimké's working plantation, Quarter Plantation, was nearby (3). Judge John Faucheraud Grimké built a summer house he called Belmont. The bricks used in its construction were of poor quality and the "walls disintegrated" (1, p. 65). 1819  Judge Grimké passed away (3). 1838  On January 1, James Lambright purchased approximately 300-400 acres of land from Mary Smith Grimké, John's widow, for $1,200.00 (2) (3). 1842  Lambright built a large two-story house. He continuted to call his plantation Belmont (2). Circa 1860  The Dillards purchased Belmont (2). Lore claims Belmont's slaves were afraid of the house at night because of the many trees that surrounded it (2). The house built by Grimké was of poor construction and deteriorated (1, p. 65). Lambright built a two-story house on the property in 1842. This house was still standing in the late 1950s (2). Information contributed by Grant Hayter-Menzies, some of which came from a newspaper article by Carl May published in the Spartanburg Journal and Herald on April 5, 1955. Information contributed by Louise W. Knight who is writing a biography of the Grimké sisters for publication in the fall of 2018.